And you would hope the IQD would have enough strength to hold together and not leave you holding a wad of crap. So according to that 1 million Algerian Dinar would be worth $8400 whereas 1 million Iraqi dinars are worth $840. The whole emphasis is that both have corruption and their economy is dependent on oil at about the same percentage. Comparing the circumstances on both countries their value (Algeria’s) is 10 times Iraq’s. Just read an article about the Algerian Dinar. Now bear in mind the economy of Algeria is based 90% on oil. Sound familiar. We have said and heard that the IQD is undervalued. Now compare the exchange rates DZD = .0084 cents per DZD. IQD = .00084 cents per IQD. Not an enormous amount but significant. So this really tells us that the IQD is truly undervalued. How much is what the market will eventually tell us. Oh but my sources say $52 per Dinar on April 1. Well the fools will really be going at it on Monday April fools day. One name on this was Terrence Keller. Could this be the infamous Terry K? Has he posted anything of late Since he was acquitted maybe not? The RV Switch Has Been Pulled...Reno On Fire. Urgent....In Iraq Now...1 to 1...Contractors paid. I have to agree with Kap. 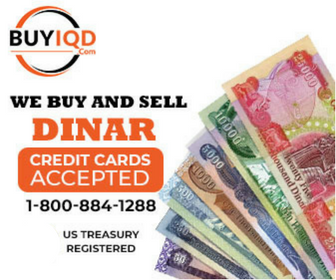 The very fact that so much Dinar is in circulation it would be almost impossible to RV or RI. Common sense and a little math tells us that 40 trillion does not allow for even 1 to 1 much less 3 or 4 $. Gradual increase like it was doing back in the mid 2000 time frame is our best bet in my opinion. Just had a Chinese lunch and the fortune cookie said “Sing and rejoice,fortune is smiling on you”. Hopefully Luigi will read this and give up trash hauling to this site.